When it comes to picking an X-Ray security scanner there’s a lot to think about. One of the big questions to answer is: do you go for a cabinet scanner or a conveyor scanner? They have very technical sounding names, which to the general business professional can be quite confusing. To help here’s a quick-and-simple handy guide to the main differences between a cabinet x-ray scanner and conveyor x-ray scanner. Conveyors and cabinets vary in features and functionalities, but they can all detect explosives, incendiaries, weapons and contraband, and all have high quality screens that display this. Although there are many different features and capabilities to the scanners, which all serve a purpose. For the professional who’s still building their knowledge of security this is something you can gradually pick up as you expand your understanding of the principles of security management. For now, one of the main differences that will determine what machine you are looking for is the size of the machine itself and its chamber. 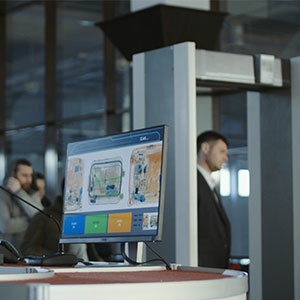 A conveyor scanner is what most people may imagine when they think of security scanners, probably because this is the kind of thing they are used to seeing in airports. These are suitable for high capacities and busy businesses. They’re ideal for parcels as well as a range of baggage sizes. For example this conveyor scanner for taking bigger bags, mail, hand-held baggage, and luggage while the TR50A is ideal for post, parcels, small bags and briefcases. Conveyors are ideal for Law Enforcement & Government Buildings, Banks, VIP Residences, Hotels, Shopping Malls, Schools & Universities and Public Event Venues. Cabinet scanners offer the same detection benefits as a conveyor but in a more compact format. Rather than a rolling conveyor built, which requires maintenance, you open and close the door on your items that you need to scan, with a 3 second quick operation. These are ideal for mailrooms and reception areas as they take up less room than a conveyor and can be stood up, moved around on wheels or even placed onto a table or desk. They offer a variety of chamber sizes and bonus features, such as the TR15 smart scan which offers smart card access.